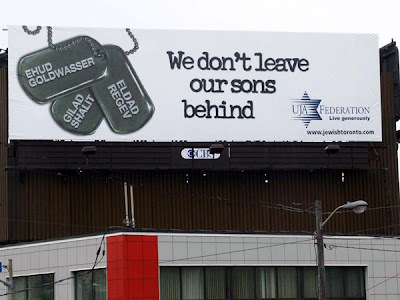 So yesterday, as I was sitting in synagogue as part of the seventh day of Pesach, I was thinking about the 'We don't leave our sons behind campaign' that the United Jewish Appeal has put out this Spring. I have to admit that since doing my conversion classes (I was once Roman Catholic) that I have a heightened awareness of current events and world issues especially as it pertains to Israel and the middle east. Seeing these signs and billboards up the past month have made me feel a tremendous sense of compassion for people living within Israel and the surrounding areas as well as for those families who have had a child lost/taken or not returned during the war. As a parent to five children, including three who are Jewish by birth - being confronted with the reality that perhaps these could be my step-sons, or sons of other Jewish mothers I know causes me to feel a combination of emotions including anger, resentment and sadness. Upon reflection, I know that any mother would feel this way if their child's life was sacrificed during a war, including those of the Palestinian people, Iranian people or any people for that matter. I have been thinking that I was proud that Israel has a proactive approach to not leaving their soldiers behind, however my world was shook yesterday as my Rabbi discussed in his congregant speech about how the Israeli army will sacrifice healthy/active soldiers to retrieve the bodies of the slain/killed/captured soldiers and that this in fact is a very controversial issue within not only Israel, but for every Jew regardless of where they live. This shook me because I had felt proud of Israel. If I was a mother to one of these children - I would want them home, to be buried in peace and have closure. I hadn't really thought about sending someonelse's child in a high-risk situation to retrieve my child. That's something else - and I have no clue how you work through the moral/ethical dilemma surrounding that issue. In the end, I feel...I don't know how I feel...except maybe torn. Posted by Tania Little at 5:26 p.m.